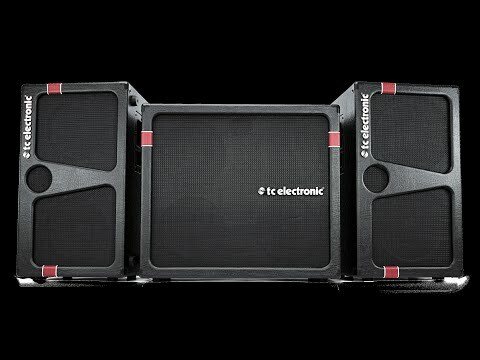 The new K210 bass cabinets from TC Electronic not only look the part, they sound it as well. Behind the vintage looking exterior you'll find.. The new K210 bass cabinets from TC Electronic not only look the part, they sound it as well. Behind the vintage looking exterior you'll find two custom 10 inch speakers and a 1 inch ceramic tweeter to deliver all the low end you need with exceptional clarity and punch. This cabinet has an impedance of 8 ohms and a power handling of 400W. At a surprising weight of only 20kg this cab was built with the modern bass player in mind. For you to be able to perform your best on stage you need impeccably clear sound, and that's exactly what the new vertical stacking concept delivers. By stacking vertically, you retain your tone's natural low-end, while also being able to hear every single detail in your playing loud and clear. You can mix and match our different cabs to your heart's desire and find the exact combination of low-end rumble and high-end definition that speaks to you.. If you ever play gigs at small to mid-sized venues or at private parties, you have probably decided to only bring one bass cab sometimes. Typically one with a 4x10" speaker configuration. The solution to the problem is a unique Vertical Stacking concept. There is nothing wrong with using 4 10" speakers. In most situations, that is more than enough - the problem is that all 4 speakers are fitted inside a square box in a 2x2 configuration. Our answer is a 4x1 speaker configuration using either two 2x10", 2x10"/2x12" or two 2x12" cabs. Whether you want 10 or 12" speakers or a combination, the point is that you stack the speakers vertically.